Need a cheap idea to keep a teething baby from chewing the edges of your crib? 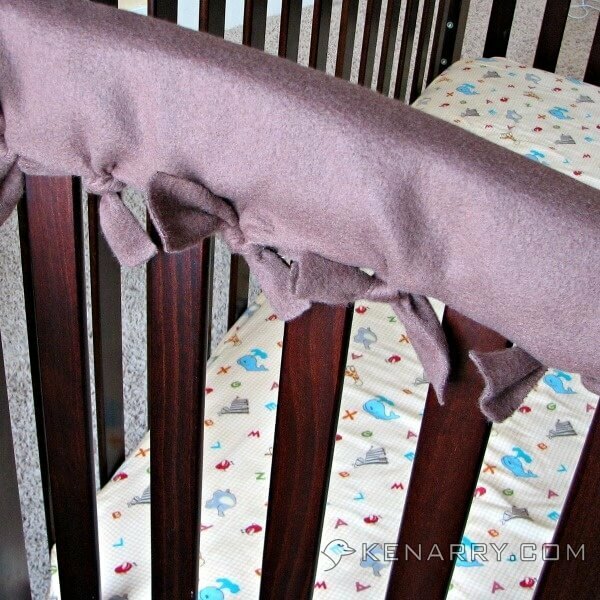 Make an Easy DIY Crib Rail Cover using fleece. No sewing required! When babies are teething, they will chew on anything they can get in their mouths. Unfortunately, crib rails are the perfect height for a standing baby who wants to sooth aching gums. 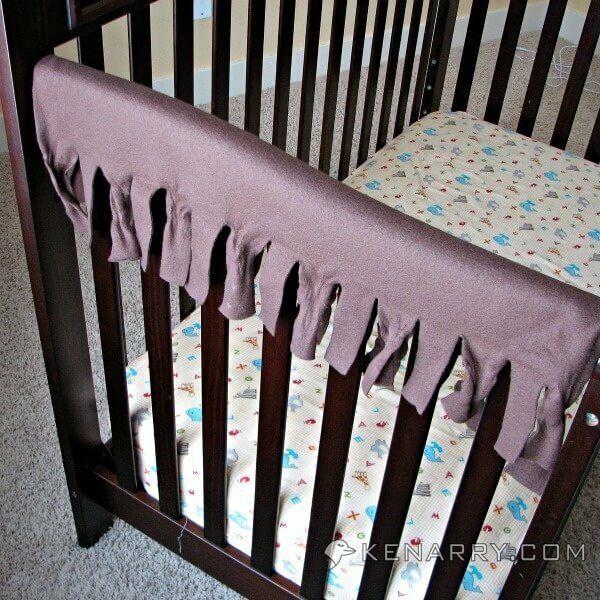 This easy DIY crib rail cover will protect both your baby and your crib. I think C1, our oldest son, is part beaver. Over the two and a half years he used the crib, he gnawed the edges until it was unsightly and raw. When we were expecting our second son, I came across an idea on Pinterest from Jane Marie Photography for a DIY Teething Guard. I only wish I found this idea BEFORE our crib was chewed to bits, but better late than never, right? 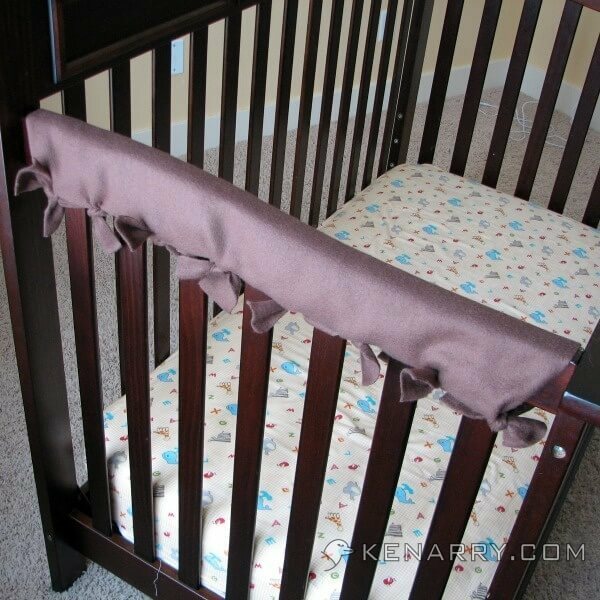 The DIY Crib Rail Cover is easy and inexpensive. 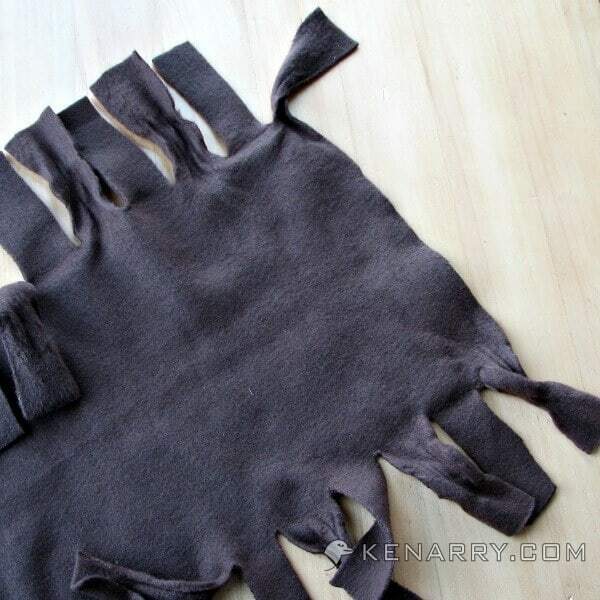 It’s made with only a yard or two of fleece and it doesn’t require any sewing or fancy tools. Best of all, it covers the damage made by C1 and keeps C2 from making it worse. There are so many fleece colors you can choose to match your nursery decor. I chose a chocolate brown fleece to blend with my dark crib. Step 1: Measure the Crib. Use the measuring tape to determine the length of the front and sides of your crib. Next, drape the measuring tape all the way around your rail and add 8 inches. This will determine the width you need for your crib rail cover. In my case, the sides and front of the crib rails are different sizes, so I needed two different widths. Next measure the width of your vertical crib railings and the spaces between them. Step 2: Cut the fleece. 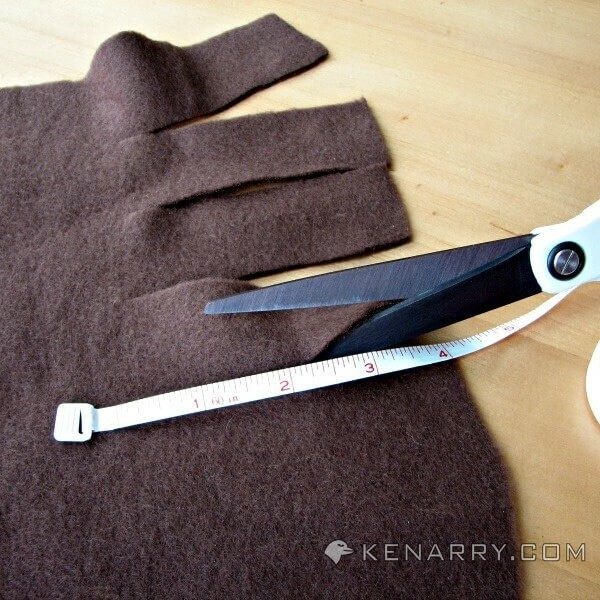 Measure your fleece and cut to the overall length and width you determined in the previous step. Next lay the fleece on a flat surface and cut four inch long slits along the length of the fleece as shown in the photo below. Use the width measurement of your vertical crib railings and the spaces between them to determine how far apart your slits should be. Alternately, Jane Marie Photography suggests draping the fleece over the side of the crib and cutting slits in the fabric in the spaces between the vertical railings. Repeat the 4 inch vertical cuts along the opposite side of the fleece, as shown. Step 3: Tie the DIY Crib Rail Cover on the crib. Drape the fleece over the side of your crib. You want it evenly positioned along the top of the crib rail. Start at one end and tie the cut strips together in the spaces between the railings. You’ll only do every other one. 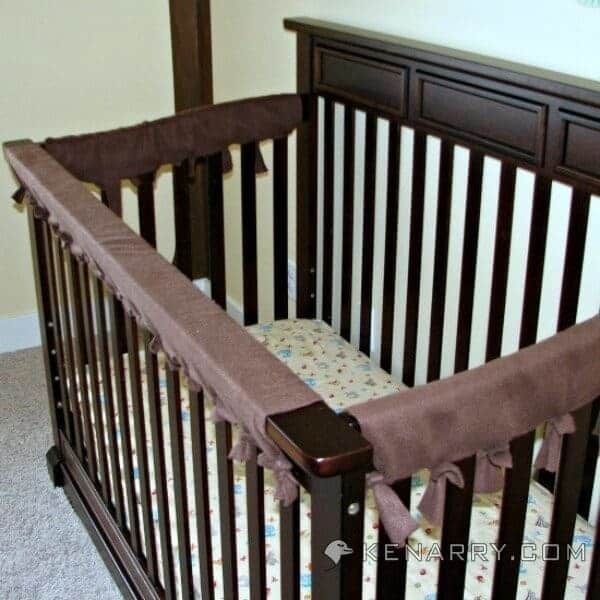 Continue until you’ve tied the entire DIY Crib Rail Cover to that side of the crib. 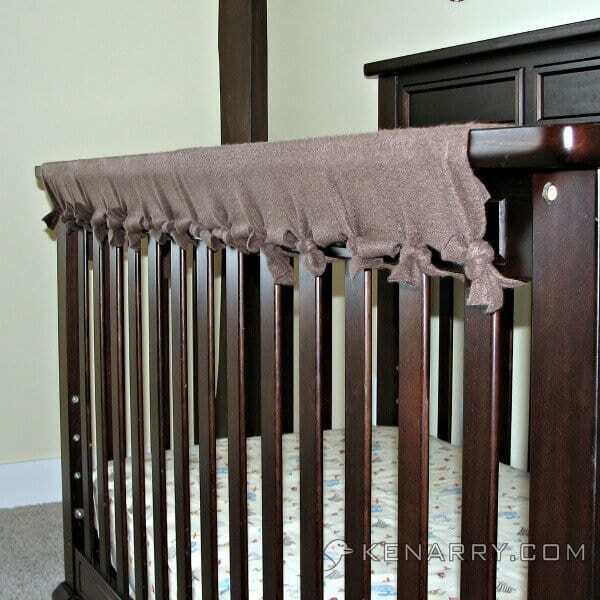 Once you’ve tied the entire DIY Crib Rail Cover on a side, you can tuck the remaining fleece strips up into the crib rail itself or cut them off. 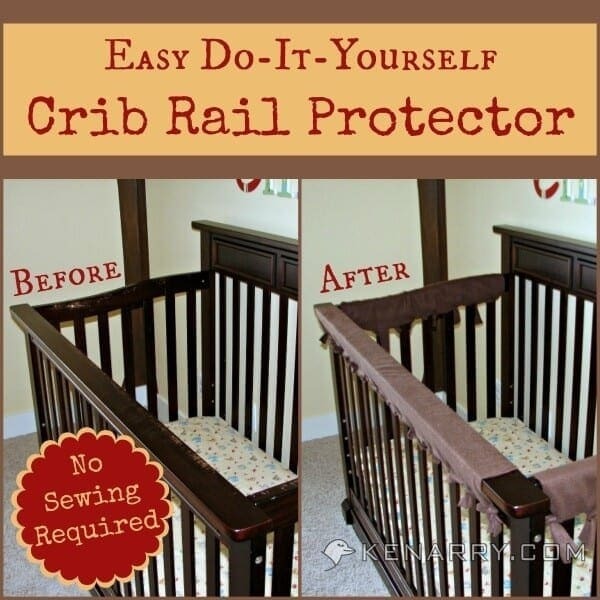 Repeat the process on the front and remaining side of the crib to finish the DIY Crib Rail Cover. There you have it! 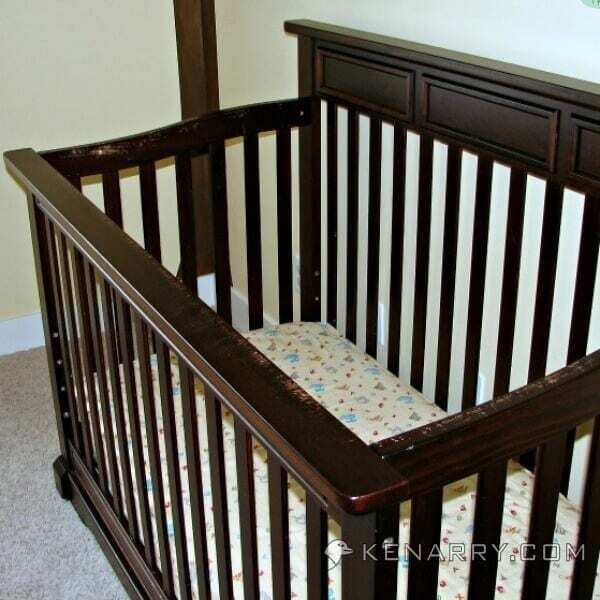 The DIY Crib Rail Cover is a simple and low cost solution to a common problem for parents. The DIY Crib Rail Cover made our crib look as good as new for our second son. At one year old, he is now chewing and drooling all over the crib rail too. Thankfully, the DIY Crib Rail Cover is machine washable. I washed ours in cold water on a delicate cycle and then dried it on low heat to help prevent the fleece from piling. Our crib is one that will eventually convert into a full-size bed. The chewed up front rail will become the footboard of the bed. If anyone has a great idea for how to refinish furniture with a veneer, please comment below or send us a link. We’re going to need it! This Inspired Idea for the DIY Crib Rail Cover came from Jane Marie Photography and was shared with their permission. Please visit their website to find more great ideas like this. Inspired Ideas is a regular feature on Ideas for the Home by Kenarry™, sharing ideas we’ve found from Pinterest or other online resources. The words and photos used in this post are our own, derived from our personal experience implementing this idea. Those days are gone forever, but thanks for sharing and linking up again with us at the #WWDParty – have a wonderful weekend. Thanks for hosting a great party, Antionette! We always appreciate that you come by to see what we’ve linked up. It’s so easy, Ashlyn! It would be a great idea to do it sooner rather than later, if your daughter is just starting to pull herself up to the crib rail. As you can see from the pics of our crib, I sure wish I had! I just did this! We have plastic teething guards, but he figured out how to take them off, so I needed something to keep them on. It was literally my “AHHHH! What can I do to stop him?! Oh I have left over fleece in my stash.” freak out moment. Visiting from Link it or Lump it. Fleece sure works great for this, doesn’t it, Becky? Have a great week! Thanks! It works great to hide the damage, Kelley! So funny I came across your post today, my baby just started doing this a few days ago. Very useful tutorial, thank you for sharing! You are so welcome, Roxy! I’m glad you found it before your crib was destroyed like ours. Good luck! What a good idea, my son bit all along his bed (when he was a toddler and in a proper bed) this might well have worked. He’s 18 in 3 weeks and still in the same bed – now he looks at the bite marks and wonders what he was thinking, even tried sanding and re varnishing them a few years ago! Does the fleece alone protect the wood on the crib or do I need to put the rubber teething guards underneath? Great question, K.B.! 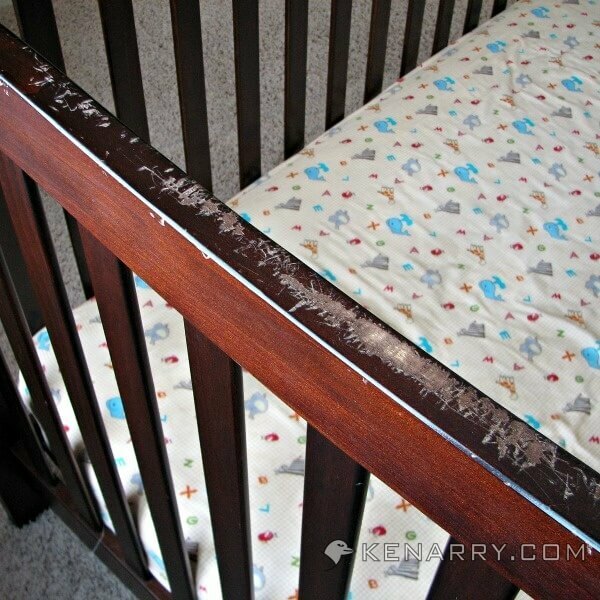 Our crib was already chewed up before we put the fleece crib rail cover on it so I don’t have any way to tell if there’s been new bite marks this time around. 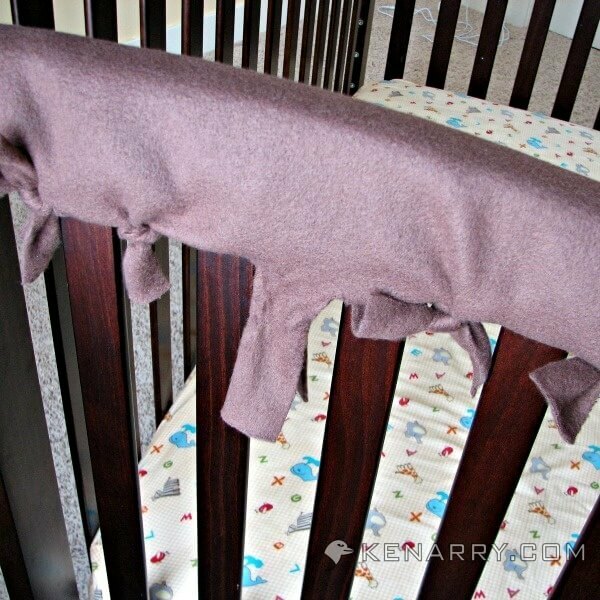 I would suggest going with thicker fleece fabric if you want to keep your crib rails well protected. If you want to be 100% sure though, go with the rubber teething guards too.